Apply for the Virtual Student Foreign Service July 2-20, 2013! This is an interesting an unique opportunity that we wanted to share with you. You are paired as a virtual eIntern with a US Embassy or other parts of the State dept for a project that you complete virtually. See below for details. It’s a great way to connect with people and gain experience during the academic year and there is literally something for all majors! You can apply for up to three opportunities by the 20th of July. 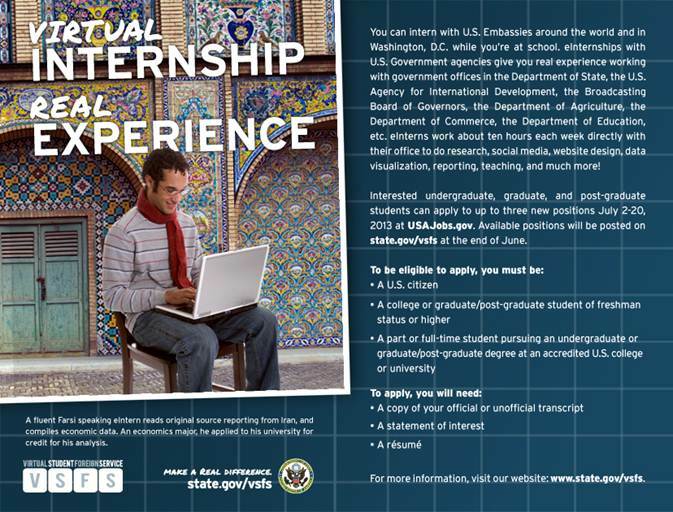 Virtual Student Foreign Services (VSFS) is the U.S. Department of State’s virtual eInternship program for U.S. citizen college students to apply to contribute to the work carried out by the State Department, U.S. Agency for International development, Broadcasting Board of Governors, and the Departments of Commerce and Agriculture. By committing ten hours per week from September through April, selected eInterns will play an important role in advancing the federal government’s reach in diplomacy, development, journalism, trade, and agriculture initiatives. This year there are 276 available projects to work on. Last year, the 2012-2013 eInternship class consisted of 343 students from all regions studying a variety of majors who worked on projects focused on research, social media, website design, data visualization, reporting, teaching, and a plethora of other areas. Interested undergraduate, graduate, and post-graduate students can apply to up to three new positions July 2-20, 2013 on USAJobs. Available positions are posted on state.gov/vsfs/209292.htm. Interviews will be conducted in August and students will be notified in early September if there is a match. Security clearances are not required. Selected eInterns will be invited to join a closed online community and will receive recognition for successfully completing an eInternship from the State Department.